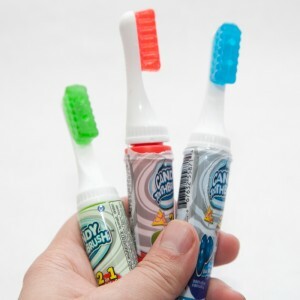 Doomsday cults and others inclined to believe that humanity is in its final days may take the emergence of the Candy Toothbrush as a sure sign of the impending apocalypse. They could argue that evil must be at hand to allow such a sugary perversion of good hygiene to exist – and it would be hard to refute this. The candy toothbrush consists of a plastic toothbrush handle mounted on a squeezable cylinder. In place of plaque removing bristles is a block of Jolly Rancher-like hard candy with two holes in it. When the base is squeezed a sickly sweet, calamine lotion colored liquid seeps out of these holes. The thing that is so insidious about this product is that the manufacturer, Candy Planet offers no warning label stating that this product cannot be used in place of actually brushing one’s teeth. Little Johnny or Sue won’t realize that they are lying through their slowly disintegrating teeth when the proudly tell their mom or dad that yes, they have brushed their teeth. It can only be speculated that a company with the name “Candy Planet” may only have more evil plans in store. What will the next “candy” be that they will dream up in their artificially sweetened minds? How far off are products such as the cotton candy life vest or the black licorice seat belt? Will our elderly hobble along on actual candy canes? Forget rogue nations and with their nuclear aspirations, the real weapons of mass destruction exist in the candy aisle at the local convenience store. The source of these illicit sweets must be stopped and the only solution is for the Candy Planet factories to be destroyed. Bombs, not regular ones – but candy bombs should fall on them, jamming their machinery with corn syrup and making the world safer for our children.